A cure-all for everything from feeling blue to breaking an ankle, this vintage candy assortment is designed to lift the spirits of anyone who's under the weather. Speed up recovery time and deliver a sugar rush with a get-well gift full of retro sweets that can't normally be bought in stores. 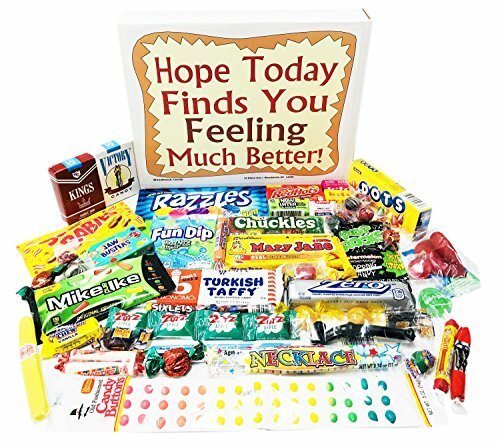 Perfect for anyone looking for an unusual and fun care package for kids or adults, this "feel better" box is a creative alternative to the standard flowers and balloons. Care package includes: Atomic Fireballs, Bonomo Turkish Taffy, Dots, Chuckles, Mike and Ike, Red Hots, Jawbusters, Pop Rocks, Razzles, Mary Janes, Fun Dip, Pixy Stix, Candy Necklace, Sugar Daddy Jr., Wax Lips, Candy Buttons on Paper, Candy Cigarettes, Bubble Gum Cigarettes, Licorice Pipe, Saf-T-Pop, Bubble Gum Cigar, Chick-O-Stick, Charleston Chew, Coconut Long Boy, Gobstoppers, Sixlets, Zero, Sugar Babies, Zotz, Lemonheads, Strawberry Drops, BB Bat, Butterscotch Buttons, Cinnamon Discs, Licorice Balls, Necco Wafers, Now and Later, Kits, Root Beer Barrels, Smarties, and Classic Caramel.